Privacy advocates are up in arms over Facebook's new facial recognition technology that helps your friends tag you in photos on Facebook, but is it really a privacy nightmare? The biggest problem with the new feature is that, once again, Facebook has opted-in all users by default, instead of allowing you to choose whether you want to Facebook digitally scanning your face. The European Union's privacy watchdogs are now looking into the matter to see whether it runs afoul of privacy rules. Security firm Sophos said the facial recognition feature "feels like Facebook is eroding the online privacy of its users by stealth." Facebook certainly should have allowed users to opt-in to the feature instead of opt-out, and there's little doubt that the social networking giant tends to leak too much user information -- the home address fiasco comes to mind. 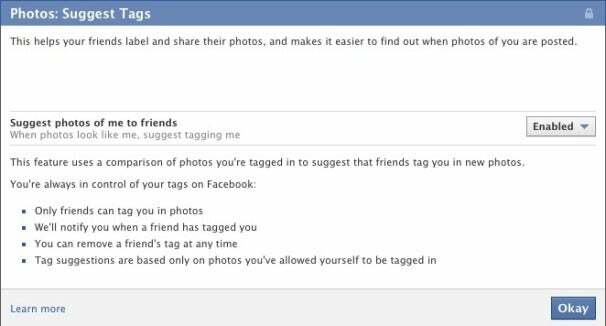 But photo tagging is something that Facebook is restricting to you and the people you're connected to on Facebook. Here's a rundown of what Facebook is doing, what the restrictions are and how you can stop it from happening if you don't like it. Whenever you upload some photos to Facebook, facial recognition technology can identify people in the images and suggest who they might be. You can then confirm Facebook's guess and get through tagging a large set of photos that much quicker. This feature is similar to what you can find in many desktop applications such as Google's Picasa and Apple's iPhoto. The biggest difference appears to be that the database detecting and tagging these photos clearly resides on Facebook's servers and is not sitting on your computer. But Facebook also puts limits on what you can do with the facial recognition technology; you can only tag photos of people you're connected to on Facebook. Every time you tag someone, they are notified that they've been tagged and can opt to remove the tag if they wish. As always, you and your friends can also remove tags from photos at a later date by simply clicking "remove tag" underneath the photo. The downside is that Facebook has a huge facial recognition database of its users, which, as Sarah Jacbosson Purewal points out, is creepy. Or is it? While I doubt Coca-Cola or Nike could derive much benefit from identifying your face (at least not until we have "Minority Report"-style billboards), the biggest creep factor would be if this database fell into the hands of governments. But there already are huge government-controlled facial databases of the world's citizens. Whenever you get a driver's license, government-issued identity card, a travel visa or even a passport your photo ends up in a government office. The US government also takes a digital photo and fingerprint scan of almost every single foreign citizen that crosses its borders. If the government wants to see a photo of your face, it doesn't really need Facebook to get it. But if you would prefer, you can stop Facebook from automatically helping others tag you in photos. Even better, as a PCWorld reader recently pointed out, you can ask Facebook to wipe from its servers any facial recognition data about you that it may have already collected. In typical Facebook fashion, the company has buried this privacy setting as deep as it possibly could, and it sure feels like Facebook is purposely making it harder to find. Regardless, here's a step-by-step guide to getting there. 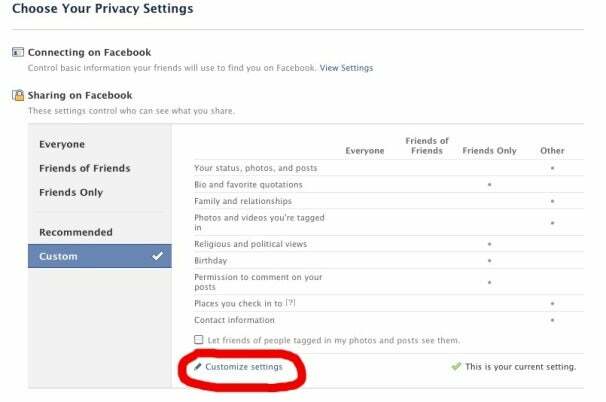 Click on Account in the upper right corner of your Facebook home page and select Privacy Settings from the drop down menu. On the next page, select "Customize settings" underneath the large chart in the center of the page. On the next page, scroll down to the heading "Things others share." Find the menu item called "Suggest photos of me to friends," and click on the "Edit Settings" button across from it. A pop-up window will appear with a box that says "Enabled." Clicking on that box shows you a drop down menu; select "Disabled" from the list. Then hit "Okay" at the bottom of the window and you're done with Phase 1. Upon request, Facebook will remove what it calls "summary information" about you that enables its facial recognition technology to compare photos of you. To opt-out, click on this Facebook photo tagging help item and click on the "contact us" link in the first sentence. This will bring up a pop-up window with a default message that says, "Please remove all photo summary information associated with my account that could be used to make photo suggestions." If you want, you can include your own message, or if you're happy with the automated message from Facebook, you can just hit "Okay" and you're done. I haven't tested this process out myself, so I can't say whether Facebook will try to contact you later on and beg you to reconsider (but I wouldn't be surprised if it did). The downside of asking Facebook to remove your facial recognition data is that you don't really know for sure whether the company has wiped the data from its servers as promised. So I guess you'll have to ask yourself: Do you trust Facebook?